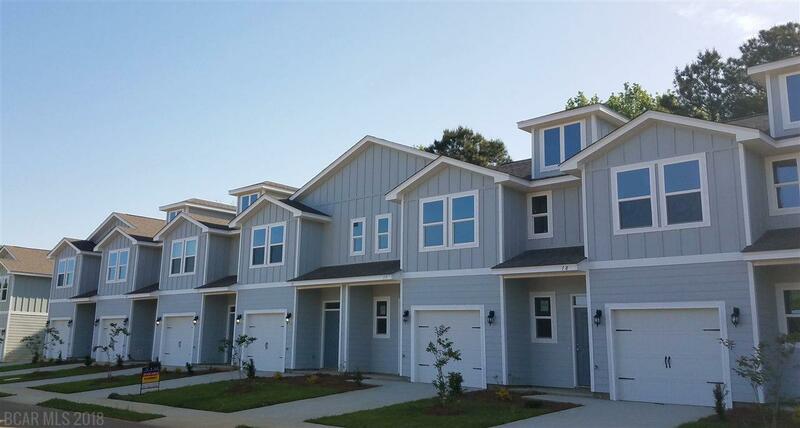 OCTOBER CLOSING INCENTIVES: $4000 IN UPGRADE OPTIONS AND $4000 IN CLOSING COSTS WITH PREFERED LENDER NOVEMBER CLOSING INCENTIVES: $2500 IN UPGRADE OPTIONS AND $3000 CLOSING COSTS WITH PREFERED LENDER Villas at St. Charles is a new unique townhome community conveniently located near shops and restaurants of Daphne. Community pool, hot tub and clubhouse. The Palm is a new 3 bedroom 2 bathroom townhome with attached garage. This contemporary townhome includes designer kitchen has a ton of counter top and cabinet space with stainless steel appliances, granite in the kitchen and bathrooms, recessed lighting luxury plank flooring in all common and living areas. The living and dining room combo is cozy yet open. The upstairs has a large master suite, 2 charming bedrooms and 2 roomy bathrooms. Stainless steel appliance come with your purchase. This home is being built to Gold FORTIFIED HomeTM certification, which may save the buyer on their homeowners insurance. *(See Sales Representative for details) **Pictures are of similar home and not necessarily of subject property, including interior and exterior colors.